With the FA WSL Continental Tyres Cup fixture between Arsenal Ladies & Notts County Ladies fast approaching, several schools got a surprise visit from Jess Clarke (Notts County & England international) and newly promoted Sheffield F.C player Carla Ward on Wednesday the 21st of September. 3 local schools in Rotherham, Sandhill Primary, Monkwood Primary & Foljambe Primary were lucky enough to get a visit from Jess and Carla who engaged in P.E & Q&A sessions with the students and gave details of their inspirations and motivations which enabled them to progress to where they are now. Jess Clarke also visited Oakwell Stadium where local girl’s teams Oakwood Comprehensive and Dinnington Comprehensive took part in the Female Football Development Youth Cup, which saw Oakwood Comprehensive proceed to the Final, but after an amazing game narrowly missed out on winning the tournament. 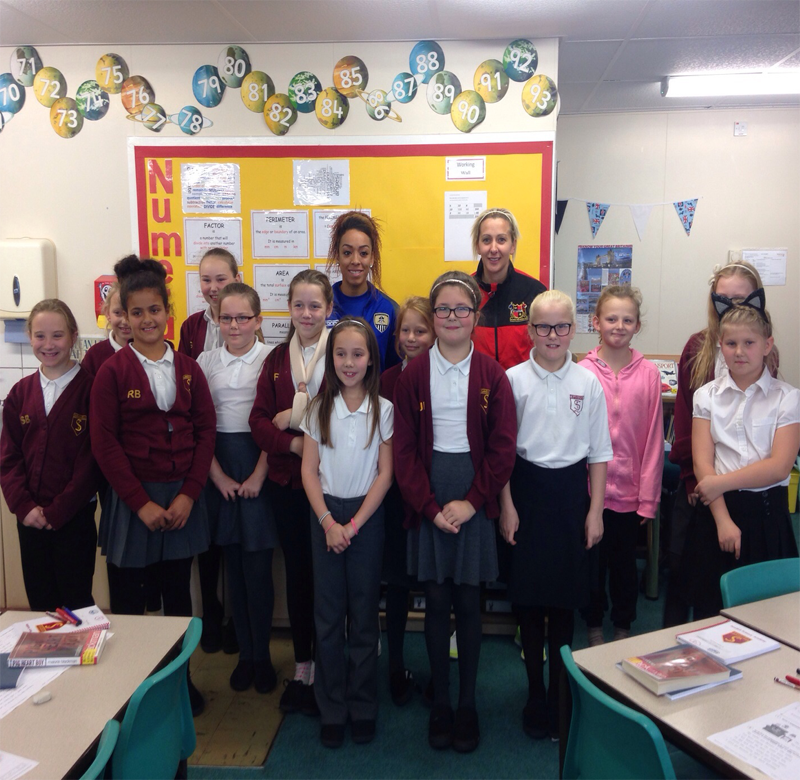 We would like to thank both the players (Jess Clarke & Carla Ward) and the local schools for giving their time to promote the FA WSL Cup final on the 1st of November 3pm K.O at the AESSEAL New York Stadium. If you are interested in attending the WSL Cup final, you can find more information here: www.rotherhamunitedshop.co.uk or by telephone on 08444 10754.